Guitarist, Bassist, Drummer, all vox. Suitable for both young and old audiences. Most suitable for punk gigs and festivals. 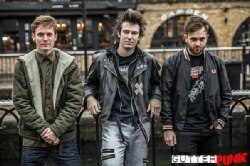 A young three piece Punk trio from Luton, formed in 2010. Rough vocals, knuckle dragging guitar riffs, driving bass and drums as loud as howitzers; HAZARD deliver a gut punching set. Audiences have likened us to bands such as The Clash, U.K. Subs, Stiff Little Fingers, Nirvana and Fugazi. Sham 69, UK Subs, GBH, Anti-Pasti, Infa Riot, Discharge,Vice Squad, Inner Terrestrials, The Members (with Rat Scabies), UK Decay, Dirt Box Disco, Dun2Def, Goldblade, The Smoking Hearts, Radkey, Dinosaur Pileup, The Skints, Menace, Peter And The Test Tube Babies, UK Vomit, Snide, Rage DC, Ministers Dead, The Kindred and many more!